With slumping prices, regulatory uncertainty and a lack of pipelines hampering the energy industry, concerns over Alberta’s oil crisis and the sector’s overall future have reached new heights. As a tough 2018 winds to a close for the oil patch, the problems facing the sector are expected to be the central issue in Alberta’s 30th election. The election has yet to be called, but must be held by May 31. "It's going to be extremely important," said Martin King, newly-retired director at GMP First Energy, in an interview. "It's still a driver of the province. It's still a driver of growth and jobs. It's going to play a vital, vital role." Alberta Premier Rachel Notley will be fighting to keep her New Democrat Party in control of the province, facing off against former federal cabinet minister and leader of Alberta's United Conservative Party, Jason Kenney, who is gaining strong support in the province, according to the latest polls. Global oil prices have held their own Wednesday morning, but Alberta heavy crude, or Western Canadian Select, has plunged. BNN Bloomberg's Andrew Bell reports. "Any incumbent government always faces challenges when the economy is not going well," said Lori Williams, political science professor at Mount Royal University, in an interview. "It's much easier to contest an election if the economy's in good shape. There has been record economic growth in 2017, and up until this oil price differential hit, we were on track for the fastest growing economy in the country for 2018. That's going to be different now." The lack of progress on pipeline development comes at a time when oil production in the province continues to grow. That was already causing a widening discount on Western Canadian Select crude, compared with its North American benchmark Western Texas Intermediate. But the problems were compounded further this fall when a number of refineries in the U.S. that process Alberta oil were down for longer-than-normal maintenance. In response, Notley announced the province would move to purchase rail cars to increase takeaway capacity, and earlier this month announced unprecedented oil production cuts in a bid to provide reprieve from the punishing oil discount. Williams said those moves will likely help Notley earn support among Alberta voters. For now, both Notley and Kenney are in agreement when it comes to taking decisive action to move crude and holding the federal government to task on the issue, but that harmony can't last much longer. 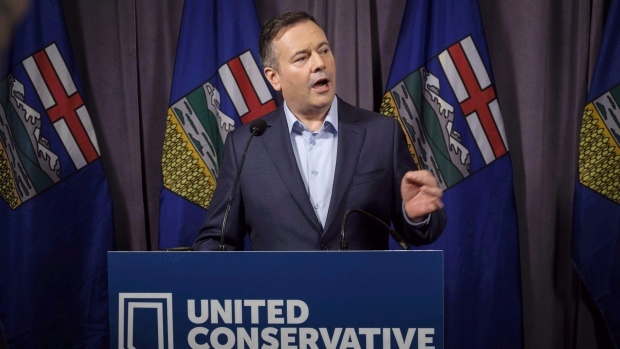 The leaders’ views on how to fix the energy crisis over the long term will be the big question dividing Kenney and Notley on the campaign trail, King said. "What are we going to do in terms of the carbon tax? What are we going to do about pushing the federal government for more access on pipelines, more rail, etc? Who is going to come up with the better solutions at the end of the day is really what it comes down to," King said. The federal government's $1.6-billion oil-and-gas support program is getting a frosty reception from the energy industry. Kash Pashootan, CEO and chief investment officer at First Avenue Investment Counsel, joins BNN Bloomberg to discuss the fallout. Both party leaders are gearing up for a big fight, and campaigning has already begun. Notley, aware of Alberta's growing resentment towards Ottawa, has begun backing away from her close relationship with the federal government and ramped up her condemnation of how the crisis in Alberta is being handled. But that's something Kenney has already capitalized on, too. "What we will see is both of the [leaders] criticizing the federal government and on that count, it will be almost a contest to see who is seen as being most effective at advocating for Alberta's interests with Ottawa," Williams said. "With Justin Trudeau being so unpopular in Alberta right now, his real antipathy towards Jason Kenney, I suppose could play well. Or, if it looks like it’s a little too personal, a little bit too petty, it could raise questions about whether [Kenney’s] able to work with Ottawa when it counts." Ultimately, the Alberta election may be determined by who voters believe will finally get shovels in the ground to build pipelines, such as the Trans Mountain expansion project. Williams cautions the need for diplomacy is also key. There is only so much the leader of the province can actually do to get Alberta’s oil moving, she said. "It's challenging for anybody because the Alberta government isn't ultimately the decision maker. It's the federal government," Williams said. "The federal government has decisions to make on rail transportation, it has decisions to make about the pipeline, the environmental review, the consultations with First Nations. All of those things are in the federal government’s hands. “So all the Alberta government can do is advocate as best it can for Alberta's interests nationally."